My lovely, yet crackers other half has been even more off the scale than usual this week and reverted to talking in riddles (for any of you who know her personally I doubt this will come as a surprise). What’s behind this erratic behaviour? I was thinking of going down the male chauvinistic route and blaming it on her menstrual cycle, but wisely decided that this may not be the best approach. Had she been on the sauce? Indulging in too much ‘E’ possibly? (the entertainment channel not the methamphetamine) Or possibly taking a few ‘E’ whilst watching ’E’ and eating Brie!? That would be enough to tip the most stable of folk over the edge. After a bit of investigative work (I basically asked her) it became apparent she’d been getting her head into Chris (Simpsons) Artist’s new prints … that makes sense then! For those of you who don’t know who Chris (Simpsons) Artist is … then you’re knackered because neither do I; he’s pretty much anonymous apparently. One thing I can be certain of though is that his comedic, surreal, child-like and often controversial sketches are unique. I’m also as hooked on the commentary behind Chris’ art, as much as the art itself. Check out the narrative for the ’Free Willy’ Poster below… It’s real funny! 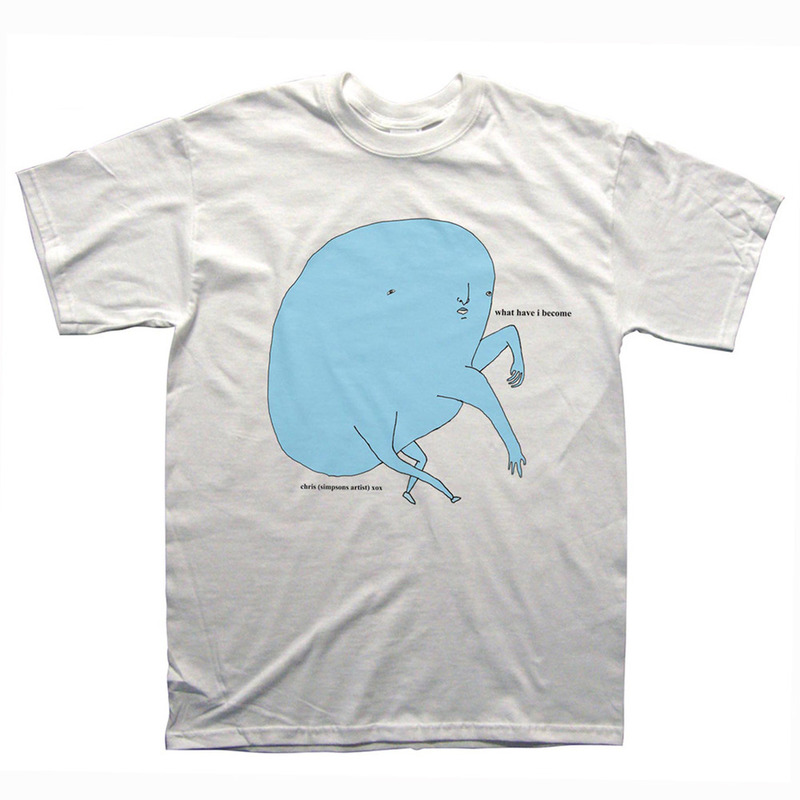 When I took a gander at the latest weird stuff on his website ‘Pictures That I Gone And Done’ I was stoked to find some nice tees available to purchase. There’s some topical and downright eerie stuff printed on these t-shirts, with many of the designs being limited to only 150 in the world … ever. This hopefully means you ain’t going to bump into your mate wearing one in Asda unless anyone I know buys one; which may well happen now that I’ve written this article. Although it’s not like we all converge in the frozen veg aisle of our local marche now do we! Anyway you get it … they’re rare! Finally, every t-shirt comes with a special surprise (I’m not sure quite how to take this!?) and a picture hand-drawn by Chris himself. What a nice gesture eh … and all for 18 quid!